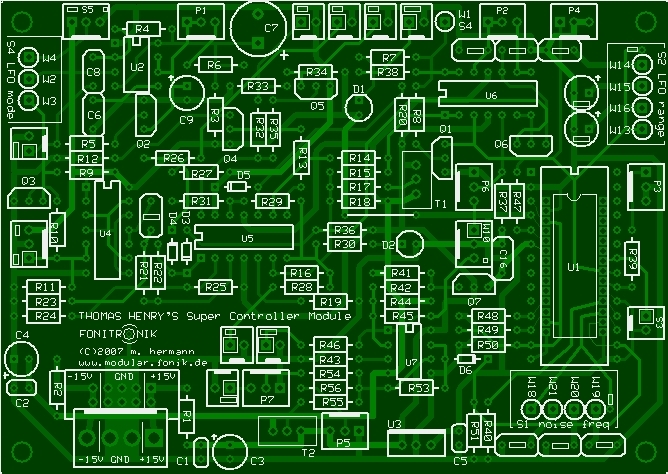 Is there an interest in Super Controller PCBs? No, it just doesn't cut the mustard, i think. there was a lot of talk about the SN76477 lately and there are a lots these ICs waiting for salvation, i guess. i got thomas henry's permission to do a PCB run for his Super Controller design, published in "polyphony" and his book "build a better music synthesizer" (many thanks to our broadminded mr henry!). boards are now available. the PCBoards size is 4.65x3.1in (118x79mm) and provides +5V onboard source and MTA.100 connectors for almost all switches, potentiometers & sockets. it will take both wide and narrow body ICs. all who placed an advance-order will have received a PM now. if you changed your mind PM me to cancel your advance-order, please! EDIT: documentation uploaded. hope that's sufficient. if not, comment please. one gated/delayed LFO (with hold function!) providing triangle and square, trigger and gate outputs. a great companion to the SN76477 Voice!? there is the LFO section to the left. you will choose mode of operation with a switch selecting delay, gate or switch. in delay mode the LFO will start when triggered depending on the delay time - so you can create delayed modulation. in gate mode the lfo is alway on until you plug a cord in (switching jack socket). from now on the LFO is on when a gate signal is present. in switch mode you can perform a "hold". the LFO stops as soon as you close the connected (foot?)switch. a status LED above the mode selector indicates the LFO working. there is a selector for the LFO range, a rate control and a LED indicating the speed of the LFO. there are four outputs: triangle and square wave, the gate and the trigger outputs a derived from the LFO. the gate is derived from the square wave output but going from 0V to approx 10V (or whatever, depending on a resistor value). the trigger is derived from the triangle and delivers a 1ms pulse. don't forget: the output is gateable or controlled by delay or switch! the S/H section in the middle: the S/H is clocked from the LFO trigger and provides a portamento (lag) and depth control. the noise section is to the right: the frequency range of the noise source is selectable by a switch. furthermore there is a filter control (known from the SN voice) and a attenuated cv in for the sweep, which base is set by the initial control. you can select external or internal (LFO) sweep modulation. Yup, one for me! Cheers! Sure, I will take 2 for myself !! Can you design with something other than the 4136? I loved your resonator board, but wonder if there could be wider cap spacing to fit little AVX box caps. Edit- Something onboard to regulate +5vdc off the +15 rail would be cool. Subject description: is there an interest in professional manufactured PCBs? Matthias makes an interesting point here. Just imagine if we lived in the halcyon days of cheap SN76477 chips at Radio Shack again. With a pair of these and not too many extra parts we could have come up with a very complete synth voice on an extremely small foot print. Apart from the missing VCF, such a combination would have been the equivalent of the Octave Plateau Kitten synth whose PCB was easily 10 times as big! I'm not kidding, either, having ripping into those those things quite a bit to tweak and tune them. Actually, it's not out of the question. As I've mentioned before, a person need only ask and I almost always give permission (unless I'm planning on doing something with the circuit myself). So, if someone actually asks me if it's okay to post SuperController stuff, I'll probably say yes, as long as it doesn't conflict with Matthias's plans to run off a PCB and cut into his hard work designing it. I would like one or two. Put me down for one, Matthias. Great guys !!! Thanks ! Well, actually, I don't have any SuperController stuff anymore. What I was getting at is that if anyone wants to post what they have here, it wouldn't bother me. The main thing is, don't post anything that would interfere with Matthias being able to make a PCB run worth his while. 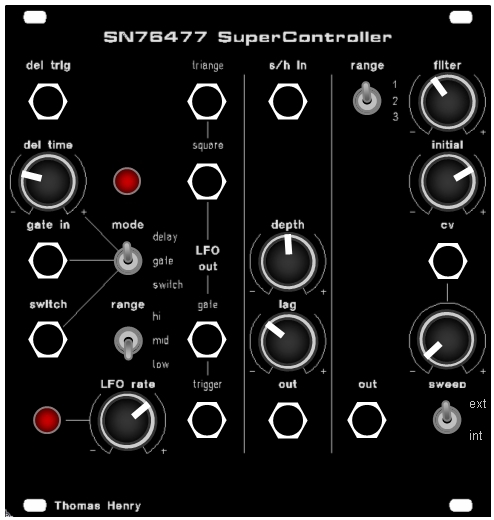 Wow, Thomas Henry's SN76477 frenzy continues! Please do put me down for two PCBs. A couple of suggestions - pads for both the regular DIP and shrink-DIP versions of the 76477 would be very helpful, most of only have one or the other. Also, replacing the 4136 with an op amp using a more standard TL074 type pinout would help most people out. Huge respect and gratitude to Thomas and Matthias!